Komodo National Park is located on a steep and rugged topography in the active volcano shatter belt that is located between Australia and the Sunda Shelf. Komodo is the largest island within the topography and is dominated by hills that are oriented on a north-south axis at an altitude of 500-600 meters. At the peak of Gunung Toda Klea the steepness climaxes into precipitous deep, rocky gullies. The Komodo coastline is characterized by bays, inlets, irregular coastline, and beaches. The coastline’s inlets are separated by headlands that often fall in a steep cliff into the sea. Padar –This island is located to the east and is a small and narrow. Its topography rises steeply from the surrounding plains to an altitude of between 200 and 300 meters. Rinca – To the extreme east you are going to find the island of Rinca, which happens to be the second largest in the Komodo complex. 70% of the total area of the 219,322 hectares Komodo National Park is characterized with open grassland and woodland savannah. The most dominant tree in the park is the lontar palm that occurs in a scattered manner. 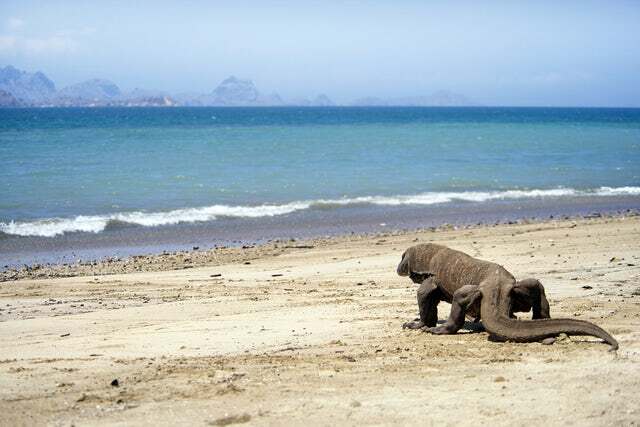 Among the fauna species that have endeared this park to tourists include the Komodo Monitor, which happens to be the largest lizard in the world. Others found within the park are the crab-eating macaque, the rusa deer, wild boars, water buffalo and some domesticated horses. For those that love bird watching, be sure to capture as many of the 72 bird species as you can. The most endemic to the park is the yellow crested cockatoo, common scrubhen and the noisy friar bird. Marine mammals that you are most likely to spot include the blue and sperm whale, and about 10 species of dolphins. Reptiles in the park include 5 species of turtles and of course the Komodo lizard. There is evidence of human settlement in the Neolithic times as testified by the Neolithic graves found in the park. Also notable is the artifacts and megaliths that were found on the Komodo Island. It goes without saying that this is one of the top Indonesian tourist destinations and you will rue your chances if you fail to visit this destination during your Indonesian tour.